Provide comfort for the family of Helga Vohs with a meaningful gesture of sympathy. 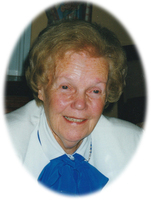 To send flowers in memory of Helga Anna Elsabe Vohs (Hansen), please visit our Heartfelt Sympathies Store. We encourage you to share your most beloved memories of Helga here, so that the family and other loved ones can always see it. You can upload cherished photographs, or share your favorite stories, and can even comment on those shared by others. Debbie, Jade, and the Boards from YYC, YEG & YLW sent flowers to the family of Helga Anna Elsabe Vohs (Hansen). Wilhelm, Cheri and family, our sincere condolences. Wil, your mother was a happy, wonderful lady who always had a smile on her face. She will be missed by all who knew her. Brad, Christine, Erin and Mitchell. Dear Wilhelm and Cheri and family: our sincere condolences! In Helga we lost a very good (bridge) friend. She will be missed by many friends! Wish you a lot of strenght for the future!